Magicbox Parabola review | What Hi-Fi? Ah the Meridian F80, £1500 worth of micro system… wait a minute, £40?! 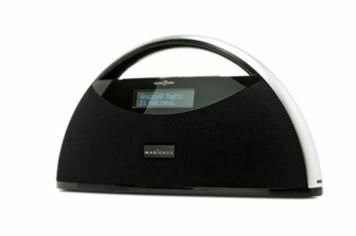 Yes, the Magicbox Parabola bears a striking resemblance to Meridian's famous system, though this radio is yours for a fraction of the price. Unsurprisingly, the build isn't in the same class as the F80, the whole thing being rather flimsy on its feet, and the buttons being a little unresponsive at times. Still, the display is clear and you'll find DAB and FM radio, a headphone socket, and a choice of mains or battery power. We have fairly low expectations for such an affordable radio, but it's still hard not to make something of a face at the bright, thin sound that emanates from the Parabola. Listening to BBC Radio 1Xtra there's little sign of much bass weight, punch or power, while Absolute shows pop and rock sounds thin and struggles with clarity and overall detail. The FM tuner isn't particularly strong, so should you be in a weak signal area you might not uncover your full complement of stations. It does offer something different in terms of design if you're on a tight budget, but sonically it's no great shakes and far from ‘balanced' as the name might suggest.